Dura Feel VIII is a contemporary golf glove with a stylish appearance. Nike uses a combination of polyurethane, nylon, and goatskin in its manufacture to give it an incredible performance and durability. It has some perforations on the back section for breathability and a stretch fabric on the fingers for flexibility. Dura Feel VIII is a contemporary golf glove with a stylish appearance. Nike uses a combination of polyurethane, nylon, and goatskin in its manufacture to give it an incredible performance and durability. It has some perforations on the back section for breathability and a stretch fabric on the fingers for flexibility. Dura Feel also includes genuine leather on the palm and an Angled Tab Design for a comfortable fit. It comes in five different sizes and two color options. Material: The materials for this glove are polyurethane (85%), nylon (10%) and goat skin (5%). Design: It is an enhanced synthetic leather glove with some perforations on the back section to improve the range of motions and breathability. This golf glove also has a genuine leather material on the palm which is what provides the excellent grip. Stretch Fabric: the strategic placement of a stretch fabric on the back and the fingers enhances flexibility and breathability of the Dura Feel VIII. Angled Tab Design: The Angled Tab Design is an outstanding feature because it gives the glove an ergonomic and comfortable fit. Colors and Sizes: It is available in two colors which are a plain black and white with a black patch on the knuckles. This golf glove also comes in all the main sizes to ensure that every male golfer can find something that fits him. The perforated leather at the back enhances breathability and gives the glove an impressive range of motions. You can use it in any weather because it does not sweat in hot days or slip when wet. It is a very flexible glove which is due to the stretch fabric. The Palm is genuine leather which means that you always get an excellent grip. This glove is very affordable despite the high-quality materials and construction. You can choose between black and one that comes with a white shade and with a black section on the knuckles. The closure is adjustable to ensure golfers always get an ergonomic fit and support. A few golfers complain that the sizes are not right. The synthetic material can make it quite hot when playing in the summer. It does not have the best stitching, and this will affect its durability. You only get a single glove in the pack which is something that most golfers will not like. 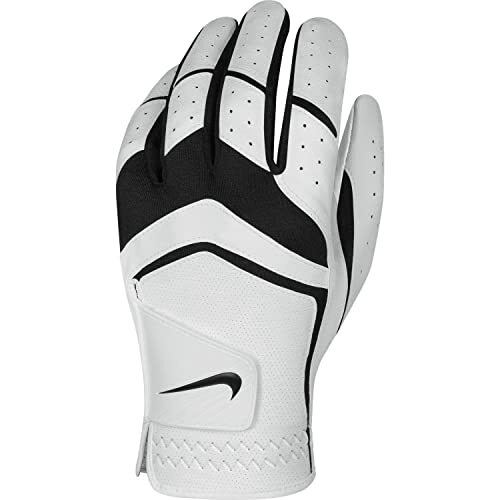 The Dura Feel VIII is an outstanding all-weather glove by Nike that will make sure that golfers always get an excellent grip. The stylish look is one of the first things that you will notice with this glove, but the performance and service that you get are what will make you want to use it for long. It has a unique perforation on the back section that makes it very breathable to keep you hand dry at all times and also improves the range of motion. Many other features make this glove a perfect choice, and they include the genuine leather on the palm and the affordable price tag. And although there are some complaints about the fit and stitching the bottom line is that it is a best golf glove that guarantees that you always get a good grip and it is also very comfortable.